Order your QSC K8 Tote Speaker Bag from AMS and enjoy Fast & Free Shipping. Get the Best Deal with our Lowest Price Guarantee & Great Customer Service! 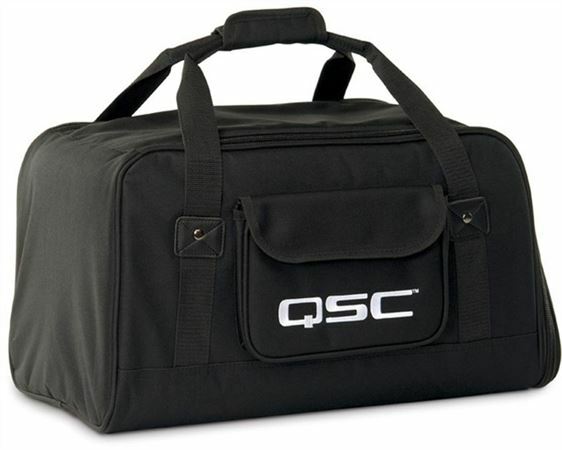 The QSC K8 speaker bag is a soft, padded tote made with weather resistant, heavy-duty Nylon/Cordura material. Keep your speakers looking their best when you are transporting them to your performance. The affordable QSC totes are designed for dependable speaker protection. Fits both K and new K.2 series. I wish quality could be better. A bit price, but exactly what I want it to do! I'm pretty sure these are price locked by the manufacturer, so nothing against AMS. The bag is just the right size and has the padding it needs to protect the speaker. I just wish they were $10-$15 cheaper in price. Excellent bag for the speakers. Well worth the money. If you’re going to spend a lot on speakers, why not pay a bit more to protect them? I take the K8s out for mobile gigs numerous times a month, so these bags have definitely been put to use. The bags are built very sturdy and are designed well. Along with the big zippers and thick material, there’s a pocket on the side to keep cables and the power cord. You can also carry the speaker either on its side using the strap, or from the top handle of the speaker via a flap that opens up the bag to reveal the top handle. Definitely a good investment if you want to have your speakers last longer. perfect fit, will save the speaker.. I did cut a piece of 1/8 inch thick masonite and wrapped a towel around it and placed it in the bag in order to give my K8.2 grill protection and uniform support. Nice bag to protect your Investment!